I'VE LOOKED AND CAN NOT FIND HOW TO BUMP A THREAD/P0ST INCLUDING A SEARCH AND CAN NOT FIND ANYTHING ABOUT IT. ALSO WHAT IS A BUMP? I'M ASSUMING IT BUPS YOUR POST TO THE TOP. Just reply to your thread, write "bump" and hit reply to your post. Be advised - the Marketplace Rules allow only one Bump of a For Sale/Wanted thread every 24 hours. Hey all! My friend referred me to this forum. Looking forward to keeping up to date with trends through here and also buying/selling/trading! 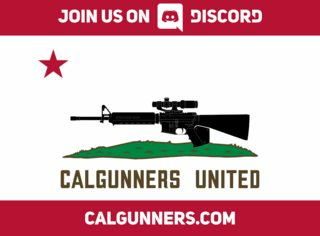 Hey there, I just signed up on Cal Guns. Looking to learn as much as I can from you folks. My name is Luis I’m a contractor here in souther California. New to the forum! Met one of the members today at Angeles shooting range. Anyone hunt locally on this forum? Check out the hunting sub-forum and if you do not find anything, post up a new thread asking for help. Hi Toro and welcome in. Check the hunting section for the info. Hello! My name is Jason. I just joined today. I live in the Sacramento area. I am 41, and am fairly new to California. You have our regrets for moving here as far a 2A is concerned. I was referred here by a friend. Hi and welcome in to our new members. Have fun and we're glad you are here. Hello all! Just joined and trying to take it ll in. Hi A.P. welcome and enjoy yourself. I was not too far from you this weekend; I went to DROS my H&K USP Elite at Cordelia Gun Exchange in Fairfield on Saturday. Where did you move from, what state? CZ-75B: purchased at Second Amendment Sports, Bakersfield. H&K USP Elite: purchased at Cordelia Gun Exchange, Fairfield. Find all posts by M.O.G.U.E.R.A. Just joined and happy to find a place to help sort through all the regulations on what we can and cant do in our state. Welcome and yep. We have that info waiting for you. Have any questions feel free to ask. Good morning to everyone. New member and first post from Sonoma County. Thank you for providing such a wealth of good information! Hey! I am new to this forum. I am looking to acquire some new guns and my friend recommended I check out the for sale forums. Hello Calguns, long time lurker but finally decided to join. Hi All! Trying to get into hunting, but don't have any friends out here that do. Hoping to pick up some knowledge here.